A live-in with the Sisters to experience the Religious Life. Our SEARCH program is not only for those feeling called to be Sisters, but for anyone who is hoping to determine God's call in their lives, whatever that call may be. The Winter SEARCH program takes place over President's Day weekend every year. The dates for 2020 are Friday, Feb. 14-Monday, Feb. 17. 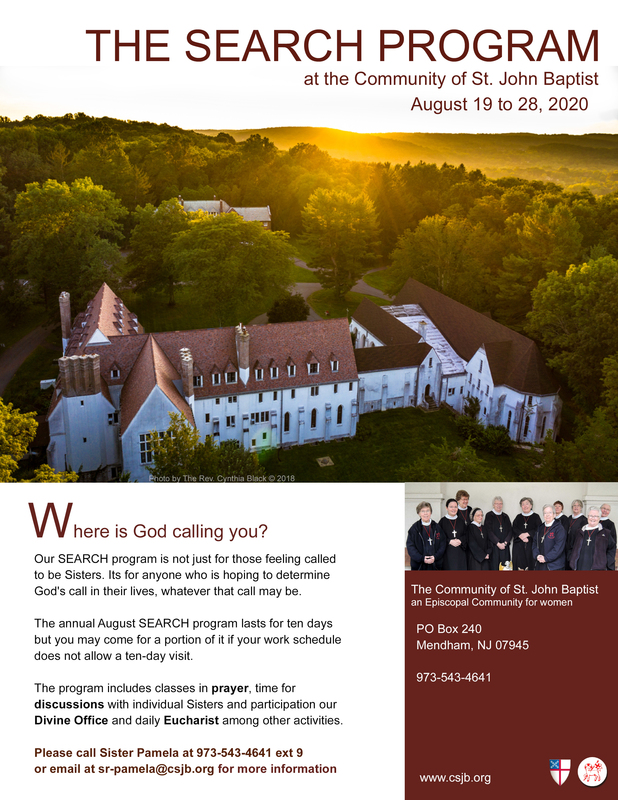 Our annual Summer SEARCH program lasts for ten days but you may come for a portion of it if your work schedule does not allow a ten-day visit. The Summer SEARCH program takes place in August every year. This year's dates are Monday, Aug, 19- Wed. Aug. 28. Our program includes classes in prayer, time for discussions with individual Sisters and participation our Divine Office and daily Eucharist among other activities. Please call Sister Monica Clare at 973-722-3197 or email sistermonica@icloud.com for more information. CLICK ON EITHER OF THE IMAGES BELOW for an 8.5x11 flyer to hang in your church or other public space.